There was many improvement with the introduction of Google’s new Android 4.1 Jelly Bean. Some of those included built-in apps that were taken from popular third-party apps like Shazam. Jelly Bean now includes its own song prediction software and you can decide whether Google does a better job or Shazam. Either way its nice to have the app included with the software. 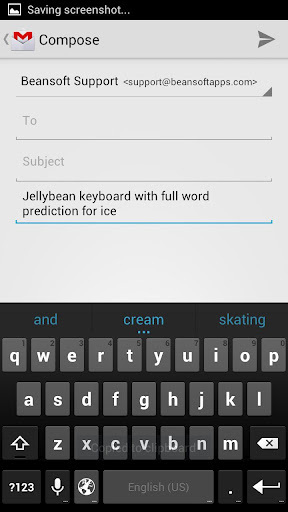 Another included app is a predictive keyboard much like Swiftkey keyboard. The makers of Swiftkey have had their app for a while and I personally use and love it. But the app does cost money while Google’s predictive keyboard is included. But most of us don’t yet have Jelly Bean and probably won’t get it for a while so we are out of luck right. Well, thanks to the open Android ecosystem the Jelly Bean Keyboard has been extracted and made available in the Google Play Store by the makers of Thumb Keyboard. It’s in the alpha stage and the user dictionary doesn’t work but it’s free for all to download and try. It only works for Android 4.0 or higher so it should be fine for tablets and phones with Ice Cream Sandwich. Try out the keyboard and let us know if you think it’s better than Swiftkey or Google has ways to catch up.